Pictured are the man-made interlocking blocks. 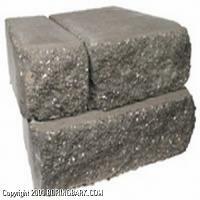 They come in a variety of colors, textures and sizes from cinder blocks to patio pavers to large wall blocks. Call for information.